Coconut oil is one of the greatest inventions since, well, almost anything on the planet. You might be surprised to learn about some of its uses. Here are eight surprising uses for coconut oil. Use a pea-sized amount in the palms of your hands, then run it through the midsections and ends of your towel dried hair before blow drying and styling; even if you go in with your flat iron or curling iron, not to worry. 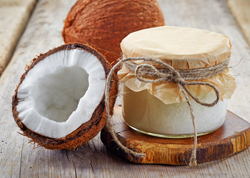 Coconut oil can withstand higher temperatures. With this in mind, make sure your iron is at the right temperature for your hair type: Below 300° F for fine hair. 300° - 350° F for normal hair. And 350° - 400° F for coarse or curly hair. You will enjoy smoother, shinier, healthier looking hair as a result. Use small amounts of extra virgin cold pressed coconut oil to smooth out rough skin and cuticles. Just apply and massage the oil into your elbows, heels, knees, cuticles, face, and legs. Apply a small amount after you shower and again before bed to get the most benefit. You can even spot-treat your pimples! Your skin will feel softer and smoother in no time. Aromatherapy can help to promote relaxation and relieve stress among other things. Use a diffuser and add a few drops of other essential oils with it. Peppermint, jasmine, lavender, and coconut are a few of our favorites. Rub a small amount of coconut oil between the palms of your hands, then rub the oil under your arms. Be sure to rub it in well and towel off any excess before dressing. After cleaning and thoroughly drying your cast iron pan, add up to a half teaspoon of coconut oil to the inside. Use a paper towel to spread a thin layer over the skillet. Place the pan in the oven at 375° F for 1 hour. Turn the oven off and let the pan cool inside the oven for a perfectly seasoned cast-iron pan. Soak a few large cotton balls in coconut oil and seal them up in an air-tight container. Pull one cotton ball out to get the fire started. Coconut oil makes great fuel! Cover the sticky substance, e.g., gum; extra glue from price tags;, etc., with coconut oil. Let it soak in for a moment, then using your fingers, work the substance out. Use a bit more oil on a dry cloth to remove any leftover residue from hard surfaces. Spot check fabric before using coconut oil. Often a mild dishwashing detergent is all that's needed to remove the oil.